Previous post: The story behind the “1984″ Mac ad. The Sun was just barely below the horizon; north of me I could see its first rays touching the topmost antenna of the power station, miles away on Pride Peak. It was very still and very beautiful. 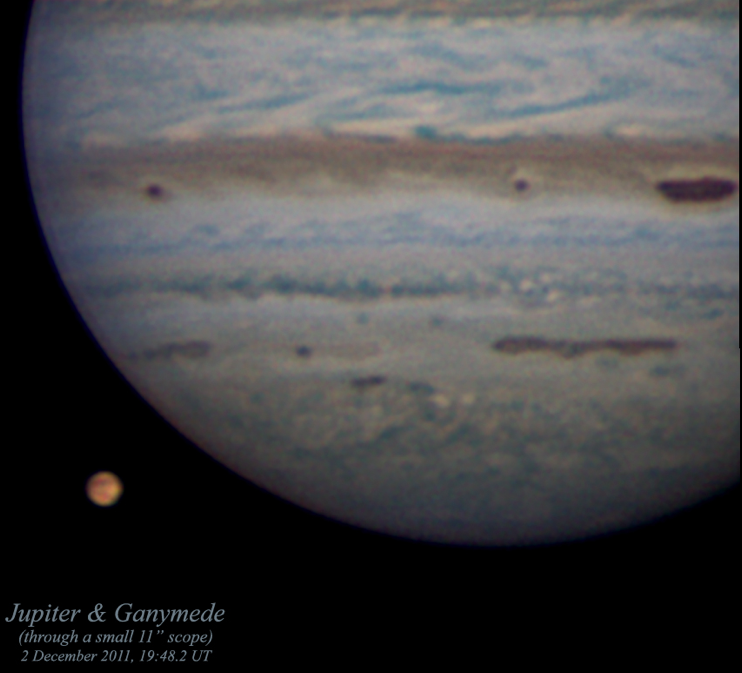 Overhead old Jupiter was in half phase, bulging and orange and grand. To the west of it Io was just coming out of shadow; it passed from black to cherry red to orange as I watched. 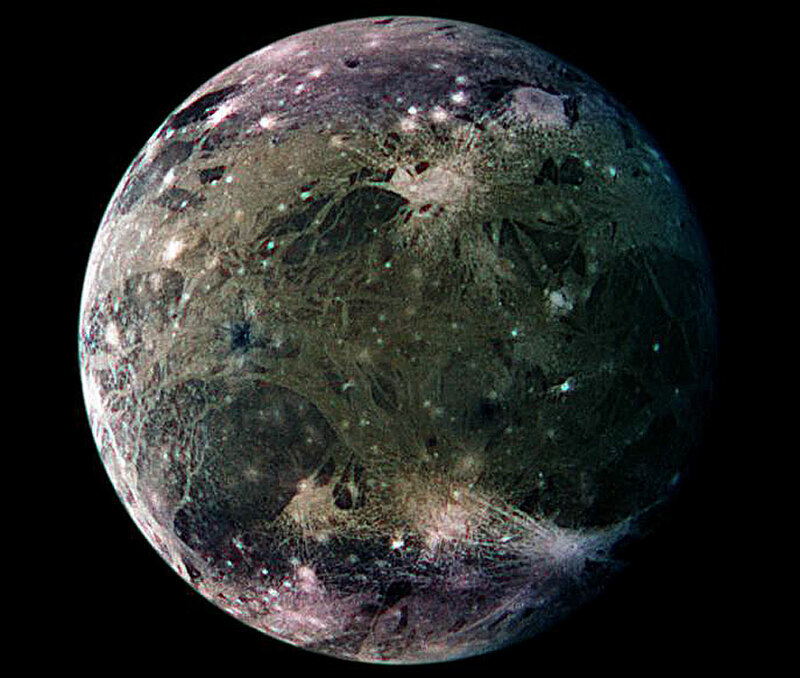 I bet this is very like what Bill saw when he went outside on Ganymede and looked up. I am of course quoting from Farmer in the Sky, one of the novels Robert Heinlein wrote for serialization in Boy’s Life magazine (which was why there were always Boy Scouts in them). Sometime in an overpopulated Earth future, Bill and his father, George, emigrate to one of Jupiter’s moons, there to build themselves a farm. It’s a story in three, possibly four parts, beginning on earth with George springing a surprise wife and step-sister on Bill, continuing with their Earth-to-Ganymede transit on the good space ship Mayflower where Bill saves everyone from a hit from a micrometeor and gets beat up for his pains, their first years on Ganymede pulverizing rock into loam and breeding it into life, and Bill’s tagalong on an exploratory trip around Ganymede. Of course we should not have complained. After all, as George pointed out, the first California settlers starved, nobody knows what happened to the Roanoke Colony, and the first two expeditions to Venus died to the last man. We were safe. She started a tirade…The Captain cut her short. “Have you ever washed dishes? he asked. …that meant taking whatever you came to — granite boulders melted out of the ice, frozen lava flows, pumice, sand, ancient hardrock — and busting it up into little pieces, grinding the top layers to sand, pulverizing the top few inches to flour, and finally infecting the topmost part with a bit of Mother Earth herself — then nursing what you had to keep it alive and make it spread. It wasn’t easy. It sure wasn’t, but with hard work and perseverance and a sense of humor they will succeed. By the time you’re at the end of this book, you’re kinda ready to board the Mayflower II and follow them out there. Or maybe Europa, or Alpha Centauri or Epsilon Eridani, or…well, the only way I’ll get there is to write my way there, and I already did that. Back to work for me. It ain’t farming, but it’ll do. If you like Farmer in the Sky, try The Rolling Stones, Between Planets, Space Cadet, Have Spacesuit Will Travel, Red Planet and Citizen of the Galaxy. You won’t be disappointed. I never am. Whether it’s his older work, like Farmer in the Sky or his latter things, like “Time Enough for Love, Heinlein is just magical! I don’t know how he did it, but he could make a future so believable that even when the technology he’s described is patently out of date, it still seems real! Maybe that’s because tha people are so real! Thanks for the reminder! I share your enthusiasm for Heinlein’s young adult stories. My favorite is “Have Spacesuit, Will Travel” which is one of the first books I ever checked out of a library. I think many of these stories are better than some of his more celebrated work. If you like colonization stuff, I suggest you try Stephen Gould’s “Helm”, an interesting take on starting a colony from scratch. My pleasure, Deborah! I’m a terrible proselytizer for books I love. Already read Helm, Bud, and love it, it’s now a comfort read. Assume you’ve already read Gould’s Wildside and Jumper (and Reflex). There’s also a pretty damn good read titled “Second Star” floating around. I’ve detected a marked Heinlein influence there. I’ve been on one of my periodic Heinlein reads. I’m up to and into “The Cat Who Walks Through Walls” right now. When I finish with RAH, I’ll start on the “Star” trilogy again. Comfort books, just like comfort food. I’ve read all of Gould’s stuff except “Wildside” which I can’t seem to find anywhere. I really enjoyed “Blind Waves” as well. A very interesting take on global warming as well as WS. Gould is another author who builds really believable characters.